Uniform is a pattern that gives you knitters a lot of freedom! Build your own cardigan, your very own staple sweater, was the basic idea. I'm so happy to be able to share this project with you—I've been working on it since last summer. The pattern is easy and fun to follow—you get to pick and choose from the elements provided. There are three different body types: A-line, straight, and fitted. Two body lengths. Two different styles of sleeves (bell or fitted). Two types of neckbands. Two styles of pockets. An optional waistband tie. There are a lot of different combinations that would be great! The two I chose to start with are shown above. The long version was knitted in Quince & Co.'s Owl and it features a-line shaping, bell sleeves, simple neckband, patch pockets, and the waistband tie. I love this one for it's coziness, for it's slight 70's vibe, and for it's easiness in making a casual outfit look a little more eye-catching. And, of course, I love the big pockets! The second version was knitted in Brooklyn Tweed's Shelter. This version (I'm wearing it right now) is a true wardrobe staple. A little elegant with the shawl collar, a little rustic with the tweedy yarn, and again—easy. 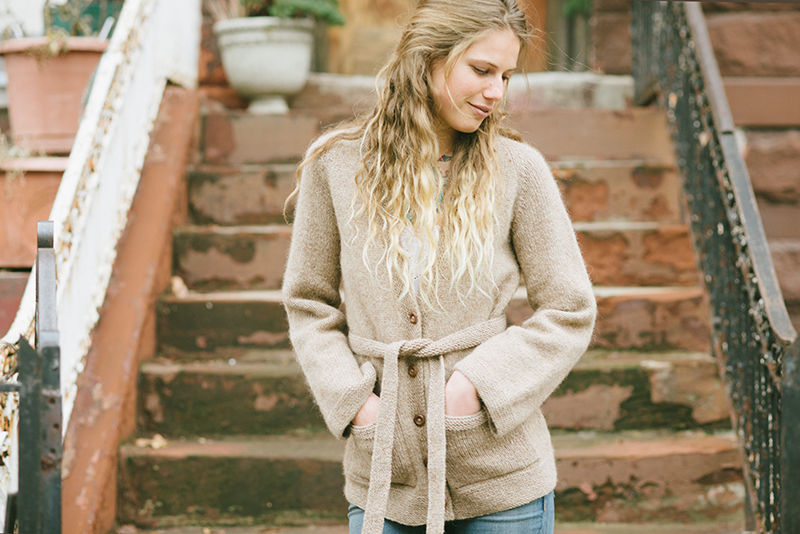 This cardigan makes simple clothing, look simply lovely...don't you think? The pattern is available here and on Ravelry. Check back next week for some other accessory patterns. And, welcome to my new website if you this is your first visit!